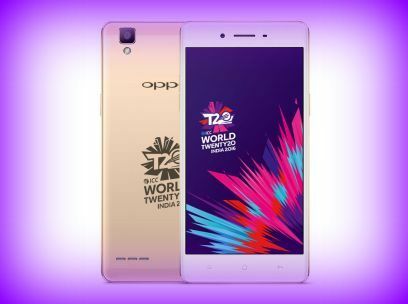 Oppo launched a new limited edition smartphone for T20 world cup. The company is the global partner of the event. Dubbed as Oppo F1 ICC WT20, the device will be offered with a price tag of Rs. 17,990. It will be offered in gold color. New Delhi: Oppo F1 ICC WT20 comes with 5 inch display with 1280 x 720 pixel resolution. It weighs 134 grams. The handset is powered by octa core Qualcomm Snapdragon 616 processor. The processor is coupled with 3 GB RAM and the internal storage provided is 16 GB. There is facility to expand memory up to 128 GB via micro SD. It has 13 megapixel camera at rear and there is also 8 megapixel. It comes out of the box with Android 5.1 Lollipop operating system. Connectivity features of the device include WiFi, GPS, Bluetooth and 4G. Battery under the hood is 2500 mAh capacity. Buyers of Oppo F1 ICC WT20 will get a free ICC WT20 2016 key chain, selfie stick and a back cover with ICC logo. Oppo is also offering the fans to win the newly launched F1 ICC WT20 limited edition smartphone through Catch the Six, contest and also an online selfie campaign. The specifications of the limited edition are similar to the original F1 smartphone. Commenting on launch, the officials of Oppo said that they are happy to release the device and are also happy to be associated with ICC. This entry was posted in Launches, Tech on March 11, 2016 by Rakesh.